A wood burning stove can be a useful addition to a house as it gives an alternative method of heating at least one room. They are most popular in houses built before 1976 as after that date building regulations started to demand a minimum level of insulation in walls. The minimum insulation level has increased since then so a modern house is unlikely to need a wood burning stove to warm a single room. Installation costs: this involves dropping a steel tube lining down the existing chimney, fireproofing the hearth area and making good any plasterwork. Typical costs are from £750-£2,000 depending on the exact work required. A slate or granite hearth will cost around £200-£250. Tiles will be cheaper, around £100-£125. The stove: wood burning stoves of heat outputs of 4kW-10kW retail for between £500-£1,500 although designer stoves can cost substantially more. Saving money is not generally the main reason for installing a wood burning stove in a house with gas central heating, as there are other energy investments which would payback quicker, such as solar pv panels. However, a wood burning stove does give a level of energy security as it gives some protection in the case of a power cut. During a power cut most houses will lose not only their electricity but also their gas central heating which requires electricity to operate. A wood stove can provide heating for at least one room and can also be used to boil water for hot drinks. Also there are likely to be some savings on gas bills to offset the cost. Depending on the power output and the amount of usage, a wood burning stove could consume around £50-£150 worth of wood per year. This should be substantially less than the cost of gas that would have been used and a wood fire should increase comfort as well. It may also allow the gas central heating to be switched on later as autumn approaches and to be turned off earlier in the spring. What size of wood burning stove do I need? If the stove is to heat one room it is important to size the wood stove correctly. Whilst you want a roaring fire pushing out lots of heat when the temperature outside is below freezing, you may also want a fire on an autumn evening when the outside temperature is maybe 10°C. So a fire that produces too much heat output may be unbearably hot in some circumstances whilst a fire that is not powerful enough will not keep the room warm enough at extremely low temperatures. You want a stove where the heat output can be controlled within a reasonable range by loading more or less wood into it. The overall size of stove needed is calculated in a similar way to that used to size gas central heating radiators for a room. To find out the wood burning stove output that you need, either use our basic Heat Output Calculator or try the more detailed Radiator Sizing Guide And BTU Calculator on our Great Homes sister site (both open in separate tabs on your browser) . Bear in mind that you may want to use the heat from the wood burning stove to take the chill off other rooms by leaving the door open. If the stove is an a lounge with the door open then the warm air may rise; hall and landing and some of the bedrooms may benefit from this. What is the difference between a multi fuel stove and a wood burning stove? Multi fuel stoves can burn materials such as coal as well as wood. When burning coal it is important to have some air circulate under the coal and to allow the coal ash to fall away. A multi fuel stove usually has some form of grate to allow this. Wood generally produces less ash and can burn on a flat surface. So a multi fuel stove usually has some form of grate that is used when coal is being burnt. In more advanced models there may be a lever to allow a grate to be opened when coal is being burnt and closed when wood is used. For stoves less than 5kW output you do not need permanent ventilation to the room. Above that level ventilation is required. This can be in the form of an air brick or a floor vent. The higher the stove output the more free air ventilation is required. Some fires offer an option of a duct from an outside wall straight into the fire. Do I need a carbon monoxide (CO) alarm? From 2010 it is a legal requirement to have a carbon monoxide (CO) alarm fitted in the same room as the fire. Who can install my wood fire? What are the maintenance costs of a wood burning stove? The main cost is for the chimney to be swept. This typically costs £40-£60 and should be done at least annually. Depending on size, a stove used as the primary means to heat one room may require 3-4m³ per year. If it is used to top up central heating then this will drop to maybe 1-2m³. To picture 1m³ or one cubic metre of wood it occupies the same space as about 3 medium sized washing machines. In an enclosed appliance pretty much all wood can be burnt: Ash, Beech, Birch, Blackthorn, Elm, Eucalyptus, Hawthorn, Hazel, Hornbeam, Maple, Oak, Rowan, Sycamore, Wild Cherry, Willow, Alder, Apple, Pear, Holly. This wood needs to be dry. Softwoods are less dense than hardwoods. This means they release less energy for the same wood volume burnt. So you may well have to put twice the volume of softwood on your fire to achieve the same heating effect as hardwood. How dry does the wood have to be for a wood burning stove? The guideline is that the wood for a stove should have less than 20% moisture content. It’s important that the wood is at this level or lower as otherwise the fire does not operate well. As an example, “green timber” just cut down in the summer months could have a moisture content of 65%. If this was burnt in a fire then a huge amount of the energy in the wood be wasted by having to drive off the moisture. 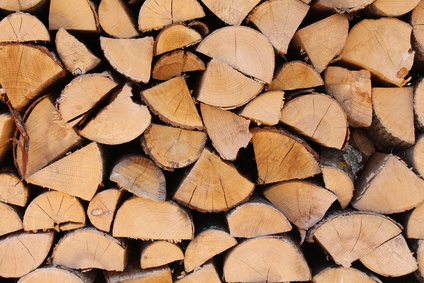 You would actually have to burn 12 logs of 65% moisture to generate the same heat as 4 logs at 20% moisture content. So it is well worth making sure you have dry wood. A good test is to bang two pieces of the wood together. If the result is a dull thud then it is probably wet wood. If you hear a hollow sounding ring then it is drier. So it’s worth paying a big premium for dry wood unless you are going to season the timber yourself for a year or two. To get it dry, after being chopped down wood is generally seasoned for 1 to 3 years. The length of time depends on the type of wood and the time it is cut down. 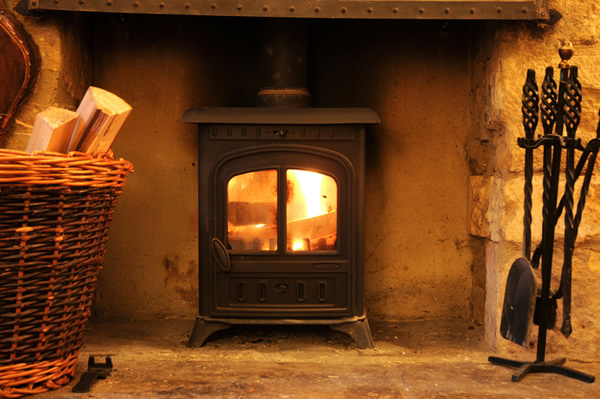 Wood for burning is generally cut down in winter when the moisture content is lowest. In spring and summer the moisture content rises so any wood would have to be seasoned for longer. Woods like Ash, Birch and Pine are seasoned for 1 year whilst Elm and Oak could take 2 or 3 years. A wood supplier may well kiln dry the wood as part of their production process. Alternatively it can be stored in well ventilated and dry conditions until it is seasoned. When buying wood, always purchase by volume rather than weight. Wet wood weighs a lot more than dry.